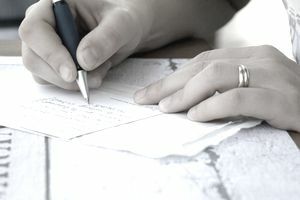 Getting a letter off on the right, sincere tone is important, especially when writing formal correspondence, like a cover letter or thank you notes. What is appropriate depends on how well you know the recipient, the reason for your letter, and whether you are writing a posted letter or an email. Often, salutations in emails will be less formal than printed letters. When emailing, you will probably want to change your salutation within a continued chain of email correspondence – while "Dear" is appropriate for an initial email, it could feel stodgy and repetitive when engaging in a rapid-fire email conversation to set up a meeting time. In this situation, it is fine to use a subsequent salutation like, “Hello again, Name” or even to use your recipient’s name without a salutation. Since the salutation is the first thing the recipient will see, it's important that you convey an appropriate level of familiarity and respect. You may want to seem friendly or more professional depending on the correspondence you’re sending. Dear: This salutation is appropriate in many circumstances, whether you know the person well, or if they are a business acquaintance, a potential employer, or a supervisor. If you know the person well, use their first name only. For a potential employer or supervisor, always use Mr. or Ms. (Mrs. or Miss when you know if the woman is married or single) unless you have been specifically asked to use their first name. For a business acquaintance or associate, your use of “first name only” will depend on how well you know the person. If you are on a first-name basis, use that. If you aren't sure, use Mr./Ms. Lastname, or Mr./Ms. Firstname Lastname. If your contact name is gender neutral (i.e. Taylor Brown) and you are unsure whether you are addressing a woman or a man, Dear Taylor Brown is also appropriate. The comma is a more informal choice and should be reserved for email. As mentioned above, "Dear" may read as being slightly old-fashioned, especially in ongoing email correspondence. While it works well for a first point of contact email, it may be best to switch to other options (such as “Hi again,”) in subsequent emails. To Whom It May Concern: This is used in business correspondence where you don't have a specific person to whom you are writing. You might use this when making an inquiry or when applying for a job where you don’t know the name of the person leading the candidate search. Nonetheless, you should make every effort to find the name of someone in the specific department that you are interested in to contact (try using a company website or LinkedIn to find a specific contact). Dear Sir or Madam: Use the appropriate gender title if you know, or both if you're not sure. This should only be used when you don't have a name to use, as you should always address your letters as specifically as possible. While this particular salutation can be construed as outdated, it’s always wisest to err on the side of conservatism when addressing correspondence within business relationships. Greetings (or, Good Morning, Good Afternoon): Consider these options as a slightly more formal version of "Hello" and "Hi." Hello: Is appropriate only in email correspondence and should be used primarily with people you know well, or in very casual circumstances. Hi: Is appropriate in casual email correspondence with people you know well. When you're writing correspondence to several people, many of the options above are still reasonable. You can write "Dear Mary, Bob, and Sue" or write "Hi Rick and Jen." But you may also want to opt for a group greeting, such as "Hi All" or "Dear Team." There’s a lot to learn about writing business letters beyond which salutation to use. Here’s a guide on how to write business letters that includes general business letter formats and templates and employment-related business letter examples. Having a sample letter to follow may help. Here’s a list of letter samples for job seekers, including cover letters, interview thank you letters, follow-up letters, job acceptance and rejection letters, resignation letters, appreciation letters, and more great employment letter samples.